Both sides set themselves up in a 4-3-3 formation though when looking deeper, there were some clear differences between the two. Napoli started with Pepe Reina as goalkeeper with a back four of Albiol, Koulibaly, Ghoulam and Hysaj behind a lone pivot of Jorginho. Two eights featured in Marek Hamsik and Allan whilst they were lead by an attacking trio of Insigne, Higauin and Callejon. In Inter Milan’s 4-3-3 formation, Samir Handanovic was selected behind centre-backs Murillo and Miranda. Before getting himself sent off before the interval, Nagatomo started at left back whilst D’Ambrosio was on the opposite side of the defensive line. Medel was the deepest of the midfield triangle behind Guarin and Brozovic. Both Perisic and Ljajic took on very wide positions in attack, flanking Icardi the central striker. In his first season at Napoli, Sarri has developed a strong possession game based on impressive ball circulation and positioning. They are particularly oriented around the half-spaces in circulation and use good movement across the midfield to open passing lanes into these areas from a deeper position. A moment from the 15th minute – Jorginho moves towards the centre to open a passing lane into the right half-space. With both Hamsik and Allan quite high in these areas, a deeper trio of Koulibaly, Jorginho and Albiol work well to break the lines of pressure. The 6 is particularly strong in this aspect and uses his positioning well to move the opposition marker to open passing lanes into the midfield half-spaces. 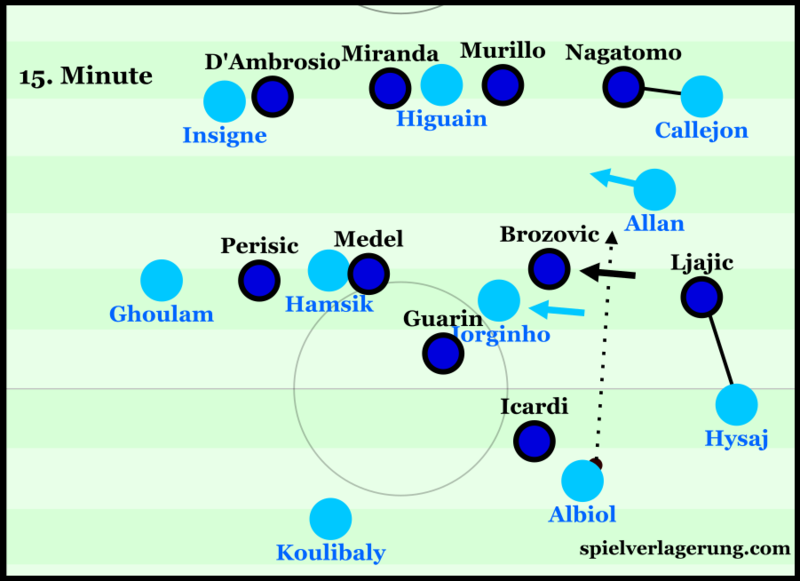 Against Inter, they were moreso focused around the left half-space as Jorginho and co. looked to reach the movements of Hamsik behind Inter’s midfield line. From these positions, the Slovak midfielder could break away from the midfield with potential to combine with the likes of Higuain, Insigne and Ghoulam. Napoli’s positioning during build-up, with a vertically uncompact Inter block. In alternative situations during build-up, usually when the ball was down the right or deeper, Hamsik would drop to a similar line as Jorginho and create an asymmetrical double 6. In co-ordination with this, Ghoulam would usually take on a slightly higher position whilst Insigne had the opportunity and space to drop deeper to create structural balance. With the Slovak deeper, Napoli theoretically had more potential to draw the Inter Milan midfield out from their mid-block whilst also benefiting from more secure ball circulation deeper. Once Napoli managed to break the midfield line, they had the potential to create dangerous situations as they directly moved forward against the Inter defence. 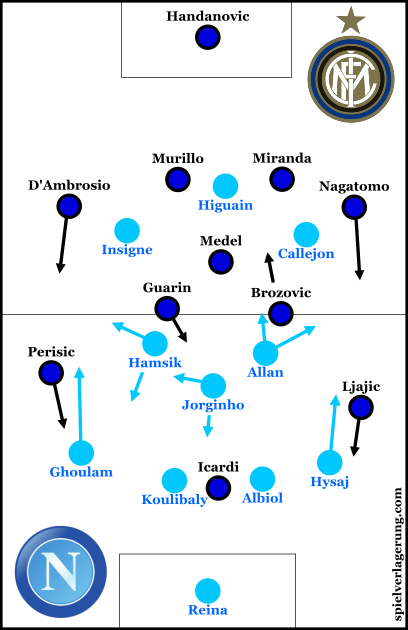 This issue was emphasised by Inter’s own defensive line who took on a rather deep position whilst the midfield was still high, causing a disconnection between the two lines. Because of this, Napoli could benefit from even more space between the lines and could better isolate the defensive line. Without the ball, Napoli shifted to a lopsided 4-4-2 shape with usually the ball-far winger joining Higuain in the first line and the ball-near moving into the midfield chain. In this structure, Sarri’s team were quite compact with both wide midfielders moving inside quite nicely to block any passes through the centre. This helped to weaken Inter’s attacks which were more based around wide attacks and long diagonal balls to a high winger. In comparison to their opposition, Inter were less dangerous with the ball. Where Insigne and Callejon were moving generally around their respective half-spaces, both Perisic and Ljajic were positioned very close to the touchline with quite a distance from them and Icardi. Aside from their wide positioning, the wingers were often on the same line as the full-backs and without a great deal of support from any central players, it immediately became difficult to establish effective attacks from wide positions. With both wingers high and wide in a very stretched attacking shape, Milan began to play lots of long diagonal passes to the ball-far winger in hope of moving the ball up the pitch and creating opportunities for dribbles in isolations. However the passes were largely cut off easily by Napoli’s full-backs as they comfortably had the time to get in front and intercept the ball before it reached its man. This is not so much a criticism of the pass, as it is difficult to execute these effectively but more the structure and general strategy behind them. With such a shape they were reliant on long-range passes which move the ball slowly and without stability, especially when the balls are going to wider areas. Due to this issue, Mancini’s side struggled to create threatening attacks and particularly in moving the ball into dangerous positions. Albeit hypothetical, one could suggest that they could have benefited from having a more stable ball circulation with shorter passes across the block. Japanese left-back picked up a second yellow just before the interval and Mancini’s side were down to 10 men with just over half of the match to get through. The manager made a fairly standard approach and switched to a 4-4-1 formation as is commonly done following a red. In reply to the newly-gained numerical advantage Sarri had his team start making deeper ball circulation, possibly with the intentions of drawing out an Inter side which struggled to control the vital spaces with 11. They would move the ball between the defensive line and Jorginho deeper and were much more patient when moving it forward during the build-up stage with the hopes that a 10-man Inter, still chasing the game, would fall into their trap. As they were still chasing the 1-0 deficit and would be doing for nearly all of the match, Mancini’s side had to become more aggressive in their pressing though the loss of Nagatomo obviously created a hazard. Where beforehand he would stay in the 2nd line of Napoli players, Jorginho moved between the centre-backs during build-up with an increasing frequency. Against Milan’s 4-4-1 press, this looked to force Mancini to putting more numbers forward as it was a very safe 3v1 in Napoli’s favour when bringing the ball out from defence. 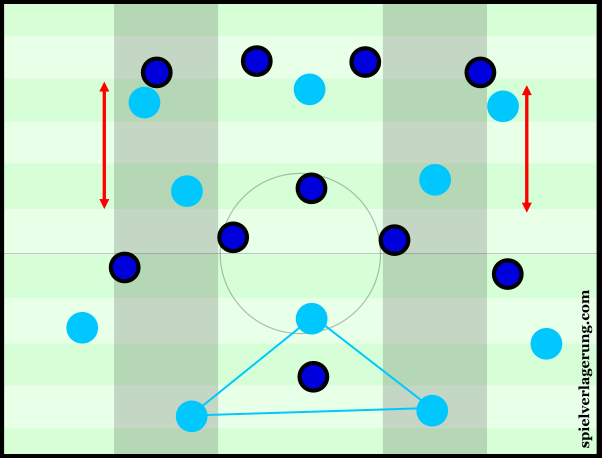 With exactly the same intentions as above, Napoli were focused on opening up space in midfield by inviting the opposition to press, then using their strong ball circulation to work around it. Aside from this, Napoli also benefited in transitions with the extra man on the pitch. Their counter pressing was strengthened with greater numerical superiority in midfield which allowed them to both attack and defend with more control. In defensive transition, Napoli could more easily snuff out any chance of an Inter counter by regaining the ball quickly whilst they had better protection against Inter’s long balls in defence. It weakened Inter’s direct possession game as their long balls became less effective due to Napoli’s increased ability to win the second ball. This was typified in the build-up to Napoli’s second as a Handanovic goal-kick was easily won by the home side who could then put Higuain in to double his tally for the day with a strong finish. Napoli deservedly won the three points over Inter Milan as Sarri’s side continue their impressive first season over the ex-Empoli boss. Although Nagatomo’s dismissal was obviously an important moment, the difference in possession was pronounced and was also a clear factor throughout the 90 minutes. Through better involvement of the wide attackers as well as superior ball circulation amongst other aspects, Napoli were clearly the better side in the tie.